Established in 2008. 10 Years of Custom Dog Tags. for all branches of the Military and Fire Fighters and more. You can order As Is. Use our Blanks to fully customize one. Honoring our Men and Women of the Military Forces and Firefighters. Customize your special message. Makes a Great Gifts. We have many styles of Dog Tags for the Army, Navy, Air Force, Marines and Coast Guard with our line expanding to Fire Fighters. Our selection includes Anodized Aluminum, Brass, Stainless Steel, Nickel plated, and Gold plated. We have Ladies Styles Dog Tags that are smaller than a standard dog tag and come with a smaller style chain. We carry over 200+ styles and types in stock. We do lots of custom work too. See our Military Key FOBs, Ball Chains, Military Bottle Openers, Camouflage Dog Tags, Silencers, Stainless Money Clips and more. Lapel Pins, Car Emblem, Flag Case Plaques and Stainless Money Clips and more. Most all products can be engraved with your special message. POW-MIA, Vietnam Veteran, Purple Heart, Iraqi Freedom, St. Christopher, St Michael and Spiritual Dog Tags. You can order any dog tag as is. Most of our Dog Tags comes with the Ball Chain and a 1" Split Key Ring. We have many style blanks to work with. We will even make just ONE! Email Us with your custom project so we can start today. We will even make just one. We Stock Many Style Blanks for a custom tag. 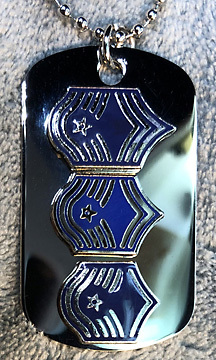 See our Samples of Custom Jobs for ideas of custom dog tags you can make.